I do believe I have shared over and over how potatoes are my favorite food. Who could not love those pure gold spuds fried, mashed, cooked, baked, grilled. I’ll even take them sauteed, steamed, or quite possibly frozen. This is a perfect recipe to teach your children because they can make a variety of variations from it, plus it can be dressed up quite nicely if one wants to pipe the potatoes mixture in all fancy (which I did not). Have fun experimenting. I never measure any more with this recipe because it depends on the mood I am in and whether I want a lower fat option or swimming in buttery and cream cheese goodness. Scrub potatoes well and prick a few fork holes into the potato to release steam during baking. Rub skins with olive oil (optional). Bake potatoes for one hour or until knife pricks through skin easily. When potatoes are finished, let them cool or your fingers will never be the same. Slice potatoes in half and scoop out the flesh (forming a little “canoe” out of the skins. Place insides of potatoes into a separate bowl. Save the skins for later. 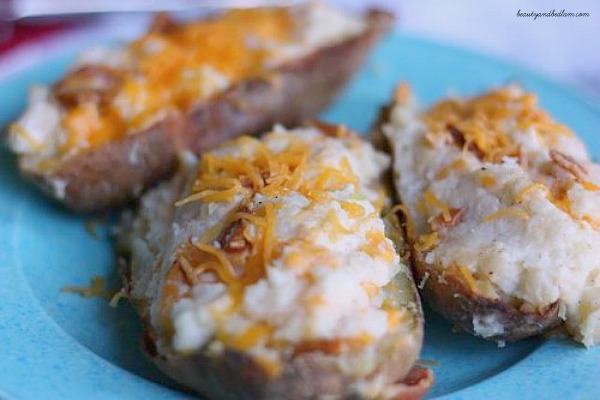 Mix the inside of the potatoes with the sour cream, milk, butter, salt, pepper, half of the shredded cheese,and green onions. Mash with mixer until well mixed and desired consistency is reached. Do not over mix or they become gluey (ask me how I know.) If this is for a special occasion, at this point you may place the filling in a frosting tube and pipe the potatoes into the skins. I just take a spoon and plop the filling back into the skin. Sprinkle remaining cheese and desired toppings. Bake again for about 15 minutes or until the cheese is completely melted. Jen, just a quick note: if you don’t want to run your oven at 400 degrees for 1 hour cook the potatoes for 3 min per in the microwave on full power (so for 4–6 min, turn, 6 add’l min) and THEN bake at 400 for 30 min. Skins are still delicious but the kitchen is less hot 🙂 and you can be done with the whole baking process in 45 min instead of an hour.